The engine block before refurbishment. 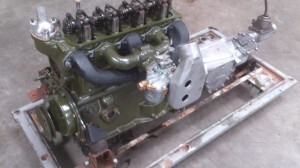 The main thing that has been getting top attention over recent weeks has been the rebuild of the engine. The milk float has a 1500cc B series engine which, being a gold seal engine is obviously already a replacement. The engine has been completely stripped to allow for an intimate check of it’s condition. 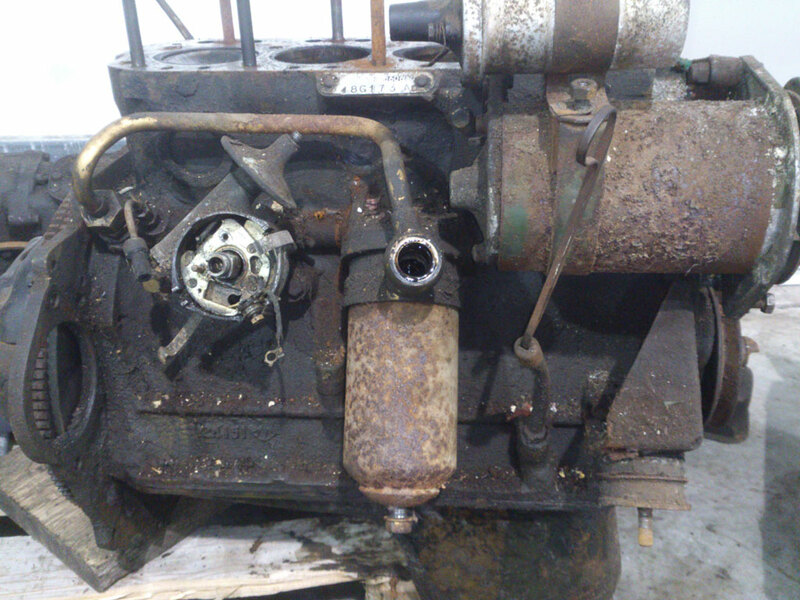 It was basically sound but with the cylinder head being sent to have new valves and seats fitted it became apparent that it needed skimmed as well so the cylinder head has benefited from a complete rebuild. As already said new valves and seats were fitted which will allow the engine to run on unleaded petrol without an additive and the complete valve gear was stripped, cleaned and rebuilt. Stripping the engine to such an extent allows for comprehensive re-painting. Traditional BMC green enamel has been used which gives the engine a fantastic new look. The starter and dynamo after work. No overhaul would be complete of course without including the rotating electrics. 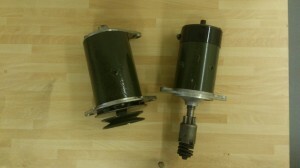 Both starter motor and dynamo have been completely stripped, painted and reconditioned. This also highlighted the fact that the front plate on the starter motor had a hairline crack. Thankfully replacements for most Lucas components are still available so a new plate was sourced and fitted. We already had a new carburettor for it so the inlet manifold was refurbed and painted and mated up to the new carb. The exhaust manifold was pretty poor with three out of the four top bolts completely siezed into place. Don’t believe all the old wives tales about remedies to remove old bolts such as soaking in cola and all that – they don’t work! Even heat didn’t work on these ones. There was no option but to grind them flat, drill out the old studs and re-tap them. (1/4 UNF with 28 threads per inch if I remember correctly). This also meant making up new bolts as well. A nice coat of VHT paint finished it off nicely. The distributor has been cleaned up, the clutch plate re-lined and the clutch master cylinder cleaned, honed and new rubbers installed. My newly found welding skills enabled me to build a cradle/trolley to allow the engine and gearbox to be mated together and be maneuverable around the workshop. At the time of writing there are still one or two minor parts at the paint shop (dynamo brackets, pulleys etc.,) and the sump has still to be fitted to complete the engine rebuild. Looking good now on trolley. One thing about restoration of old vehicles is that it is almost guaranteed to take you into new areas of expertise where you have never been before. In this case for me it was welding. As a young apprentice I worked in a garage that, at the time, was regarded as one of the biggest in Europe. 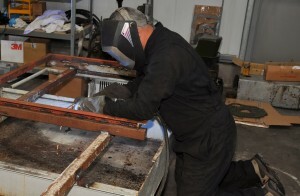 This meant that there was always a decent selection of excellent tradesmen who would always be willing to help out. As the proud owner of a Mark II Cortina at the time, which had more rust than the Forth Bridge before it’s paint job, I depended a lot on one of the panel beaters (I seem to recall his name was Ricky) to keep my rust heap on the road. The end result, of course, on this reliance on someone else was that I never learned to weld. Okay I had a brief sojourn with an arc welder during the early nineties but that just resulted in me being an expert at blowing holes in things. So during the milk float project it had to pass that at some point, welding was going to be required. 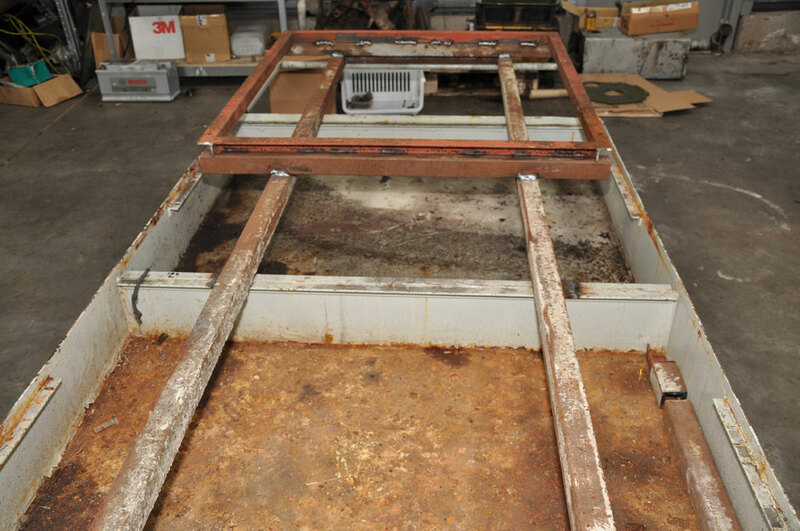 It was decided some time ago that the level of restoration that was going to be required on the milk float meant that the body was going to be lifted from the chassis so that the two components could further their progress independently so the search was on for a cradle to hold the body. Since no such thing was immediately apparent then a cradle would obviously have to be made. 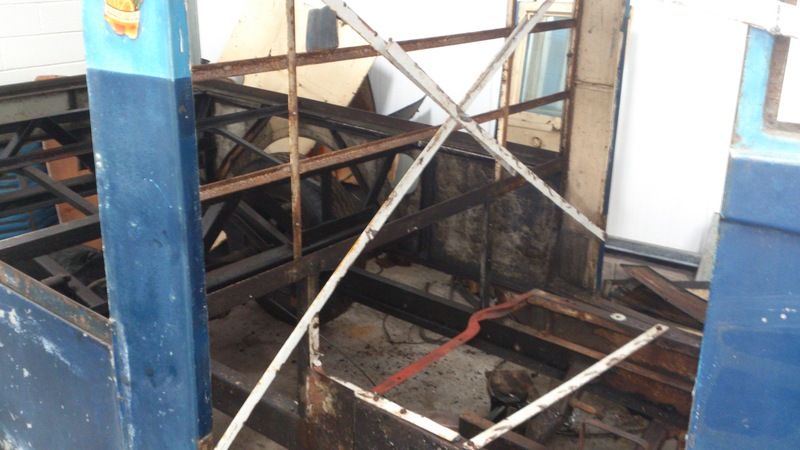 An old trolley was acquired from next door that otherwise was scheduled for the scrap heap and some lengths of metal were salvaged and I then set about measuring the chassis and cutting the materials to size. Thankfully these days MIG welding is now the accepted norm and I found this much easier than any previous attempts at welding. Now I am not going to pretend that my next career move is to become a North Sea Welder but I was pretty happy with the end result. The body has now been strenghtened for the move by bolting various pieces of strip metal at strategic points to resist warping when it is lifted. I decided to bolt on pieces of steel at this stage rather than weld them, simply because there were plenty of available holes that I could use. 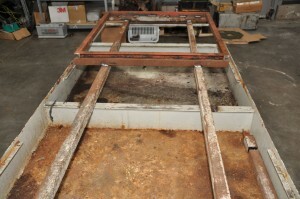 You can see the framework of steel in the image on the right. I have tested it by lifting the body about three inches off the chassis and fitting wooden spacers in preparation for the final lift off. Don’t be put off. As they always say: you should try sometihing new every day. Remember to turn on the gas! Use two hands when welding. It is much easier to guide the nozzle. So from that point of view, always wear welding gloves to avoid burns. 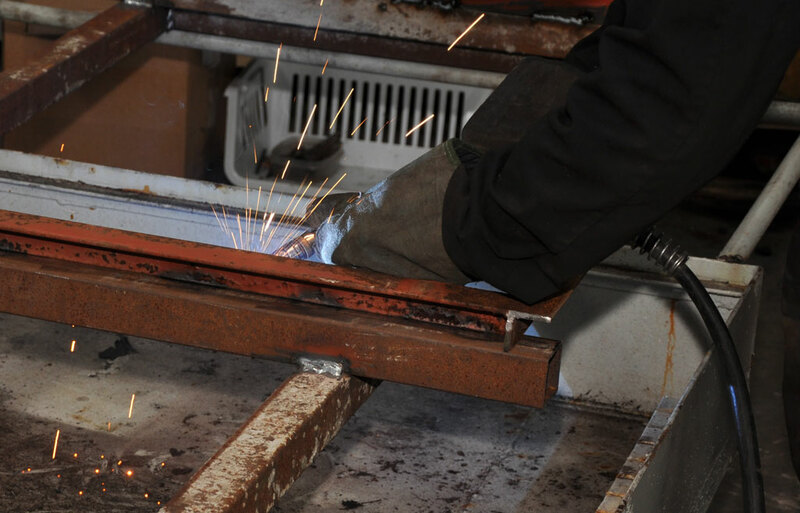 Keep the hose as straight as possible, as any kinks will slow the feed of the welding wire. Always clean any rusty metal with a grinder. Clean metal makes good welds. Play about with the speed of the wire and the power of the welder until you find a good medium that suits you: don’t try to be as fast as the guy next door who’s been doing it for years. Finally, have fun. Believe it or not it is actually quite enjoyable ( must be that macho thing). An finally, here’s that finished cradle, ready for the body.